Publicly Known Nicknames: Loup Garou-Guyver (Hungry Wolf, Guyver. ), The Howler, The Wendigo, Fenrir's Fury, War. Estimated Weight: One and a half tons (1,500). Dense muscles and a heavier than usual bone structure/armor, over a standard guyver. Dimensions: Digitigrade legs and elongated feet allow an erect posture, and comfortable travel on all fours. The length of arms is enormous, more similar to a gorilla's than a mans. Notable physical characteristics: The elbow blades are present, but tend to be weaker than standard guyver HF blades. They're regressed and, typically, unused. The outer exterior of the armor, for reasons which seem contrary to the native workings of a guyver, are covered in a fine and beautiful, silvery coat of fur. Ears are also external. The faceplate is modified and adjusted to fit over the unorthodox face; the lips and every tooth are coated in a microscopic layer modified from the rest of the suit, down to the entrance of the esophagus. Even the tongue appears to be sheathed in a thin membrane. The air vents have been micro sized to fit at the nostrils, respectfully. It's still unknown if the creature's olfactory sense still works, or if the sensory orbs compensate. The voice synthesizer lays at the back of the throat, visible when the creature opens it's mouth to howl or bite. A typical gravity orb lays at the belt, though it's never been recorded that he's used it to fly. Estimated strength: Unknown. Due to the preoccupation with the use of his claws, the beast has never been successfully calculated for strength. Among demonstrated feats, some have been: punching through an 8 foot thick door of reinforced tungsten. Others include throwing an Abrams tank (80 tons) a total of 30 yards, and decapitating at least one rival Guyver with a closed fist punch. It's suspected that if it compromised dexterity, it'd have higher strength to spare. Estimated speed: Highly efficient with the use of four limbs in place of two, both jumps and land speed travel have resulted in vast destruction of land. Reports of an unseen wave of destruction across the vast North American rural land and urban cityscape thought to be rooted in him, would make his speed of travel roughly mach 5. This is moot, of course, as he tends to travel unseen. It has been theorized that he is no quicker than a standard unit, but his unorthodox physiology makes more efficient use of balance and speed. Estimated durability: Easier to determine, but still an unknown area. Durability tends to fluctuate for unknown reasons, depending on the material presented. Debris and material contact appear to be ineffective at even high velocities; aluminum rods propelled by mass drivers have managed penetration, but they became lodged within the chest cavity, and then were forcefully expelled from the body. This uncharacteristic durability has failures; The beast tends to shy away from radioactive materials, or toxic wastes. Why this is, when even standard units have immunities to high levels of radiation and toxic environments, is unknown. Theorized root causes are perhaps phobias. It's been demonstrated that they do not affect it any greater than would work on a standard unit. A notable exception would be the element silver. The armor is generally much too durable to be penetrated by the element, but it's contact seems to have an uncomfortably to the creature. Alloy's do not work. It has to be pure, uncompromised silver to be of any affect, and silver simply isn't a rigid or strong enough material to penetrate the exterior. Nonetheless, it's theorized that with significant enough velocity, even that would provide penetration. Demonstrated Regeneration: In defiance to what is logical, the creature has been demonstrated regenerating at uncharted speeds. To the point where foreign objects penetrating the host body are expelled at high, uncompromising velocity, and even separation at the neck appears not to kill it. Suggested root cause lies in a possible mystical attribute, which is also being amplified by physical attachment to the host. Attacking the control medal is theoretically possible, but to say accomplishing this is difficult would be no exaggeration. Voice Amplifier: Estimating a ceiling in decibels has proven futile. A howl amplified by the Guyver seems capable of striking multiple opponents with the force a high powered explosion. Such a howl disintegrates the teeth within the mouth, and sends them outwards like hundreds of micro meteors, away from the face. It's an awkward technique, but it's proven a reliable projectile weapon.. The teeth, of course, regenerate, and vibrate at the frequency of the howl. Hostility level: Varies. Do not engage. Pentex Corporation appears to be the object of it's displeasure. Engage at your own peril. Unknowns: Things that defy a physical explanation. Vanishing: The beast appears to manifest from thin air, with no natural, scientifically observable phenomenon to trace it's origins or alert to it's presence. It doesn't seem to travel through hyperspace, or any tangible dimensions within the realm of natural physics. Counter-regeneration: With certain recorded discrepancies, natural organism regeneration seems impeded after wounds from either tooth or claw. In fact, what evidence there is of spirits and demons manifesting and being slaughtered suggests that all manner of supernatural beings are incapable of regenerating at full strength, with every wound made. Zombies are rent, and don't get back to their feet. Irrationally animated beings such as living shadows just seem to wither and die. Enemies that simple high frequency blades should have no capability for contact with, expire. A guyver is not equipped to cleave supernatural entities such as spirits, so it's suggested this is an ability native to the creature. Regeneration: As noted before, a standard unit should be incapable of such high speed regeneration. The theory then is that the host itself has frightening regenerative capability, and that the Guyver's own adaptation to that results in vastly enhanced ability to keep the body together. Unexplained powers: Though rarely and sparingly employed, it's been demonstrated that the host must have some strange abilities of it's own. Recorded uses have been touching soda cans and morphing them into skeleton keys, or glancing at locks and they just seem to open. Suspected telekinetic. Multiple forms: Though rare, sightings of the creature either appearing in alternate forms or morphing on the spot have been recorded. 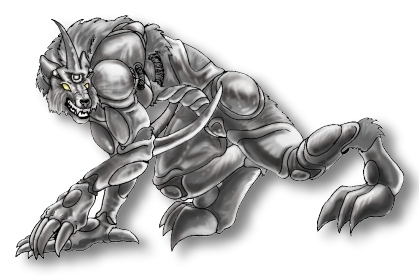 The standard host humanoid, a slightly larger humanoid host (NOT a gigantic guyver), a shape that most resembles a Dire Wolf with vaguely humanoid hands, and a pure wolf. The most commonly accessed combat shape is also the largest, at the middle of these transformations. Berserker Rage: Capability of the host guyver exceeds even warrior or gigantic guyvers for brief stints of time. Underestimating this misunderstood area, has resulted in much loss of land and property, and is still not within the realm of understanding. Suggested roots: mystic in nature. Unnatural resilience: Psy-oriented probing and attempts to bypass host mind to interface with the Guyver's control medal have been met with disturbing problems. Host has been demonstrated capable of shrugging off the more esoteric advances of it's natural enemies; creatures capable of melting non-sentient reality like candle wax, or violating physical laws and principles with their influence, appear to be contested by it's willpower. Previous attempts have resulted in berserker rages. It is highly advised not to go this route; far, far higher success has been made with contested physical power. Psionic Submariner: Attempts to weed out the presence of the Guyver in hyperspace, or really any known space when not in synch with host, have proven impossible. Likewise, attempts to discover the host through telepathic sweep has also bore no fruit. It would appear that the xenomystical elements at his disposal also make excellent cover. In a group of Guyvers, the host could stand amongst the lot of them and still register as 'human', to all but those with paramystical sensory. Guyver sensory seems blind to it, completely. Terrifying presence: Normal human beings quite literally cannot process it's existence. Even the most war hardened veteran would suffer an attack of the heart to see it move in an aggressive fashion. Guyvers do not seem immune, though they appear vastly resistant to it's effects, merely being incited to a light panic. It's unknown whether this Guyver panic is a supernatural reaction, the way it is for normal humans, or merely the result of exposure to a 15 foot tall, Standard Unit adorned, monster. Origins: Unknown. In human form, host has appeared as a middle aged man with a white beard, long mustache, and very rugged features. Suspected age is mid-40's. Tends to wear a gray hat and gray London Fog trench coat. A pair of pistols sit in side holsters, with a bowie knife sheathed at his right side. [Guyver Unit] "Are you the garou Guyver?" [Strange Man] staring into the surface of a bowie knife, inspecting his beard "Do I owe you money?" [Guyver Unit] "GUYVER", the man bio-boosts. "Are you Guyver Elite, or GSF?" [Strange Man] looking up from his knife's shiny surface, "Self employed, free enterprise." [Guyver Unit] "I've heard about you. They say you're tough. Show me what you can do!" [Strange Man] "No. It's too late for a fracas." [Guyver Unit] "Coward" starting to build a pressure cannon charge. [Strange Man] looks into the reflective surface of the bowie knife. [Strange Man] disappears from sight before the charge can land. Occupation: Owner of a bio-diesel and ethanol corporation. Investment banker. Member of Guyver team: None. Incites Delirium in humans, when in Crinos form. Werewolf: the Apoc stats, translated to freeform roleplay. Bashing damage: Bats, large falls, hammers, punches, impacts with cars. These are all bashing damage. Were-wolves automatically reduce all bashing damage by half, before any soak rolls are considered. In the WoD, they're just too big, too rugged, and too sturdy for simple blunt trauma to really phase them much. Note that unless incendiary rounds, bullets also count as bashing damage. Lethal/piercing damage: swords, daggers, cutting instruments. Sharp, impaling implements. Were-wolves can also block and soak these, albeit without the automatic half-damage benefit they receive from bashing. Lethal damage does, however, regenerate away with no problem. Aggravated Damage: Supernatural attacks. Pure magical attack, turning a flame thrower on a Garou, radiation poisoning, toxic waste, mustard gas. While soakable, they leave wounds which can't just be regenerated in a matter of minutes. They heal at the rate of one per day. Silver: Silver causes aggravated damage. A Garou cannot use their stamina to soak this damage, like they can with everything else. A NOTE ON SOAKING DAMAGE: The stamina stat is what Garou use to block things. If their stamina is high, that's their defense rating. Garou are notoriously hard to kill.. A Garou with 8 stamina is capable of shrugging off most everything, even aggravated, by toughing it out and not taking damage. It'd need to be excessively powerful and supernatural/uncommon to pierce his hide enough to cause a lasting wound. Mortals and aggravated damage: There's two schools of this. 1.) Mystical Damage. Mystical damage sometimes cannot be healed from.. The wounds just refuse to close for the rest of the mortals life, and no amount of medical treatment will fix it. It's supernatural in root cause, and requires a supernatural cure 2.) Damage from being burnt or immersed in radiation/ mustard gas. Mortals on lethal damage: Humans cannot soak swords without armor, without a +6 in stamina. Then they get the benefit. But bear in mind, that's mostly for effect. A human with a 6 in stamina is likely just to be the token Brock Samson type character, meant more for comedy than serious play. Mortals will die of lethal damage unless something is done to stop the bleeding. Lethal damage causes the loss of health over time. Mortals on bashing damage: Soakable. A human can use their stamina to block this, without armor. The Delirium: The Delirium is a state in normal, non-magical human beings where they irrationally run from Garou. This is a magical effect of seeing the Garou, and not being aware enough of the supernatural world to grasp it. There are exceptions. People with high willpower can bypass the entire Delirium effect, despite being mortals. Your average human being will be swallowed by irrational fear and hysteria, however. "WHAT DO THE ABOVE STATS MEAN?" 1: You can bench 40 pounds. 2: You can bench 100 pounds. 3: You can bench 250 pounds. 4: You can bench 400 pounds. 8: You can bench 1000 pounds. 9: You can bench 1200 pounds. 10: You can bench 1500 pounds. 11: You can bench 2000 pounds. Normal human characters fall between 2 to 3. All attributes. Willpower in WoD terms, is a persons drive. Garou use Willpower, as if it were a second supernatural power altogether. With Willpower, they can ignore pain, lift objects that before were far, far outside their range of Strength to lift, resist supernatural or psychic attack. Rage, in the game, allows you to go all Neo of the Matrix. It allows Garou to do multiple actions (which is generally accepted as an explosive surge in activity), regenerate during combat, and fuels some Gifts. "WHAT DOES HIS RANK MEAN?" A rank of 5, which is Elder, is as high as most player characters can go. His rank within Garou society. It means that within his culture, he is looked at with the reverence of a rich and influential elder. It's the designation allowed only to the most proven and knowledgeable Garou, the level of heroes. To go beyond the rank of 5 is generally forbidden for player characters, as it's the realm of Non-player characters. For instance, Jesus Christ may be considered a Rank 6 or 7 in importance. The higher the rank, the most potent and diverse the special Gifts. Gifts are powers. Garou learn Gifts by doing favors for various elemental and animal spirits, and in return, they are taught their supernatural abilities. Of course, the higher the level of Gift, the more powerful. Examples: Smell of Man will make animals leave the area. It will also make non-supernatural methods of detection only pick up the odor of a human. Sense Wyrm allows them to pick up the odor of the Wyrm nearby, like a spider-sense. The Umbra is the spirit world. Only spirit beings may exist in the spirit world, or objects which people of the spirit world 'awaken'. There are many levels: The Penumbra: The material world's "shadow". Ever played Legacy of Kain; Soul Reaver? Same concept, almost. Then you have the High Umbra and the Deep Umbra. The High Umbra is basically the spirit world, off planet Earth. A Garou could quite literally escape Earth's orbit and go chill on Spirit-World Saturn for a little while. The Deep Umbra is everything else. Alternate worlds, alternate times, elemental realms, abstract concepts, and the homes of great spirits. It's a spirit bridge for the supernatural that leads everywhere, even Ayenee. A Garou born to human parents. Homids are born from two humans (or one Garou parent with a human), Metis are Garou born to two Garou.. They're sterile, and have irrepairable deformities. Lupus Garou are Garou born to wolves. Confused? Garou cannot mate with other Garou. They mate with humans or wolves to produce fertile, healthy offspring that have a CHANCE at becoming Garou themselves. It's rare for ANY offspring to become were-wolves, so they're genetic treasure. A packless Garou. Garou move and act in groups, called packs. If a Garou has no pack, he's a lone wolf. Usually, lone wolves die, much quicker. Ralph... is an exception, to put it mildly. Garou worship and venerate Gaia, above all. She is their mother, and what they defend. Below Gaia are totems. Powerful animal spirits that the Pack venerates for special gifts. A pack under Coyote may get a +2 or so to when they want to play tricks or lay traps. A pack under Bear gains a +1 to strength, even if it takes their Homid form strength over 5! The giant half-man half-wolf form. A magical fear that is induced in humans without supernatural powers. Willpower universally, from mundane person to player character, goes from 1-10. Any stat below 4 willpower will flee a Crinos Garou, and be in such a panic that they'll forget they ever saw them. They'll literally rationalize it differently from how it happened. "Wow! That man in a fur coat sure was frightening!" It's up to the person whether or not they're affected by the supernatural. Normal humans, even ones with technology, shouldn't be immune, but since it's such a metaphysical niche fit specifically for the WoD, there won't be any huge penalties on ignoring it. True blades: HF blades at the end of every finger, over his claws, and a rubbery material covering each pad of the hand and foot that makes him capable of blocking or parrying HF blades. Technically his elbow swords are as useful as any Guyvers, but he never seems to use them. His feet are covered in the same material, as are his talons.. But you'll never catch him intercepting a blow with his foot. True Strength: 8 in Crinos form. Modified by the guyver, in chat roleplay stats, that'd be akin to 580 tons. Considering each man averaging 300 pounds of lifting strength, that'd be about 3867 men. Or 967 Garou. Using the G-orb is a force multiplier of three. True Stamina: 8 in Crinos form. Excessive and enormous in Guyver form. Thanks to the radiation proof suit nature of the Guyver, Ralph has attained the ability to soak Silver. So long as it does not touch the hosts body, and merely touches the exterior of the Guyver, Ralph will not take aggravated damage from it. True Damage: Here is an area where most technological characters fail in; tolerance and exposure to supernatural. Standard Unit power for the high frequency blades. However, an unexpected outcome of contact with those claws; A Zoanoid's carapace may regenerate after contact with a Guyver's High Frequency swords, but Garou claws are far different. A Zoanoid will hemorrhage and bleed for days, maybe weeks, after contact. Recovery from the part spirit-rending supernatural trauma is not an easy task. It can be hyper-regenerated.. It just requires about 15X the regular amount of effort, time and resources to accomplish. True Dimensions: A regular Garou is half-over the height (Ralph is 6'0 tall and 230 pounds) of the host. 9'0 in this case, and 250% over in added bulk/muscle of the host. So he'd be 1,150 pounds, outside the guyver. Inside the Guyver: 13'0 feet tall. A Guyver is roughly double standard weight, so that'd put Ralph at just over a ton of weight. G-Orb strength: Pitiful for purposes of levitation. Magnificent for boosting physical attributes. Also offers the obscene speed increase when running. Sonic Amplifier: Every bit as powerful as a standard Guyvers. It just works a different way, and can either be focused like a directed energy weapon, or a building-blasting area of effect attack. Guyver Bite strength PSI: 5,800,500 pounds per square inch. Pressure Cannon: standard unit Guyver. He never seems to use it. Head Beam: standard unit Guyver. Sensory Orbs: interact with Gifts of sensing, perfectly. Ralph can see traces of Wyrm and supernatural taint as if it were heat, being picked up by Infra Red. Regeneration: A Garou, so long as Aggravated Damage doesn't play a part in it, is capable of regenerating damage that'd just otherwise destroy a human. Working with the Guyver's natural regenerative capabilities, everything mundane, be it crushing damage or penetrating damage. The Guyver can regenerate the host during combat, as well. The CM takes over the duty of concentration to regenerate, freeing up the host to fight on. In short: you'd best be packing magical weapons, or you'll have your hands quite full. So long as it's not silver, radiation or the claws of a supernatural being, the damage will pretty much be soakable, and just about negligible. Armor exterior: As stated above, the Garou Guyver's unit has a coat of fur on it, for an inexplicable reason. These furry fibers are exactly what you'd expect from guyver hair. Their tensile strength is terrifying, and their ability to insulate against electrical attacks is odd. Umbral Travel: He cannot teleport using this. Warrior Unit style teleportation is not what this is. Garou have the ability to concentrate on any reflective surface, and 'step sideways' into the Umbra. He merely removes himself from the material world, and travels in it's shadow. It's not teleportation, it's just shifting phases and creeping through the supernatural dimension. Irregular Data: The sensory orbs that enemy or combatant Guyver's use to calculate the cutting point of Garou's armor, will report incorrect information. These instruments do not see the Mystic spectrum. For instance, a tin dagger may be enchanted by magic to be the strength of tungsten or titanium, but a Guyver's sensory orbs would only report back the strength of tin. While there's no doubt that a Guyver would be able to CUT through titanium isn't the point. A high frequency blade works by the sensory orbs reporting back the strength and durability of a physical structure, and the high frequency elbow swords use perhaps twice the estimated energy, in terms of frequency, to cleave the object. It's a rather automated process, like breathing, or blinking. However, that isn't good enough. The odds are that the momentum will halt the object in motion, as penetration fails to piece as easily as expected. To TRULY cut through Garou Guyver like any other enemy, the frequency and intensity of the HF blades would need to be manually raised. The first blow, unless it's intentionally ramped up, just won't cut it.